In 2005 two pieces of aircraft wreckage were spotted on board the Hanson Aggregates Marine dredger â€˜Arco Dartâ€™ within sand and gravel dredged off the coast of Worthing, Sussex. The parts were kept on board the vessel for over a year before being passed to WA staff during a site visit as part of the Awareness Programme. The RAF museum at Duxford was able to match a serial number identified on one of the two parts to a rear wing spar from a plane developed by Supermarine at the end of the Second World War, the Spiteful, an intended replacement for the Spitfire. However, very few of this type of plane were manufactured after the design was rejected by the RAF in favour of the new jet powered Gloster Meteor and de Havilland Vampire. Supermarineâ€™s first attempt at a jet powered fighter, the Attacker, kept the same wing as the Spiteful and, although the design was rejected by the RAF, 143 were built for the Royal Navy. The Attacker entered service as the first jet fighter of the Fleet Air Arm and several were lost at sea. 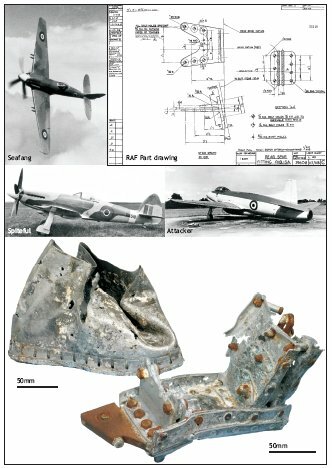 The most likely match for the parts found on the Arco Dart is the Attacker WP275 which crashed into the sea on the 6th July 1956 after taking off from Royal Naval Air Station Ford, in Sussex when the wing tip folded and the pilot ejected. The pilot, Sub-Lieutenant J. F. Yeates of the Royal Naval Volunteer Reserve, survived unharmed. Crashed aircraft are important to archaeologists because in many cases they offer a unique form of evidence for the historic development of flight. If surviving examples of a particular type of craft do exist they are often only the later models of a particular type or they have been heavily refurbished. Moreover, all crashed military aircraft are protected by law under the Protection of Military Remains Act 1986. The discovery of aircraft remains is thus incredibly important, particularly as aircraft crash sites may contain human remains.